Hundreds of thousands of homes are still without power after Cyclone Yasi slams parts of Australia's northeastern coast, battering several small coastal communities before weakening as it moves inland. 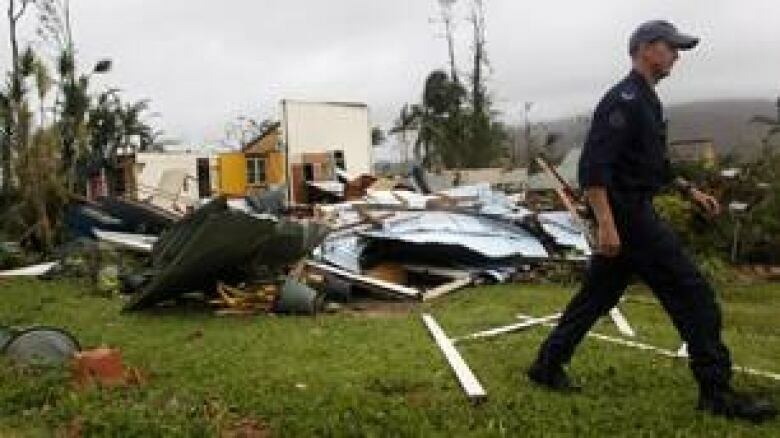 Hundreds of thousands of homes were still without power after Cyclone Yasi slammed parts of Australia's northeastern coast, battering several communities before weakening as it moved inland Thursday. The storm slammed the towns of Cardwell, Mission Beach and Tully when it roared ashore late Wednesday, unleashing heavy rains and raging winds of up to 280 km/h. Forecasters at the Australian Bureau of Meteorology had said Thursday that the storm could still unleash "damaging winds," with gusts above 90 km/h and flash floods as it moves further inland. The storm uprooted trees and toppled power lines when it made landfall. As many as 180,000 homes in northern Queensland were still without power late Thursday, ABC reported. Prime Minister Julia Gillard flew to Townsville in north Queensland to begin inspecting the trail of destruction left by Cyclone Yasi. She was briefed by local officials and was to tour cyclone-hit areas on Friday morning, ABC reported. "I'm very glad to be here and I'm looking forward to the opportunity of talking to people, talking about their experiences and talking about what's needed to recover," she said. "We're definitely rebuilding Queensland, coming back from this cyclone, coming back from the floods." Cyclone Yasi was sure to add substantially to the estimated $5.6 billion in damage from flooding and other weather disturbances since late November. Yasi was expected to cost insurers around $3.5 billion, Reuters reported, citing the forecasting service Tropical Storm Risk. There were no reports of serious injuries or deaths related to the storm, but at least one person is believed to be missing. Initial reports suggested two people were missing, but police later located one of them. Ian Stewart, a deputy police commissioner in Queensland, said he is optimistic the other person will be found alive. "We are hampered in those investigations by the fact that we have many mobile phone towers which are actually damaged and not working at the moment," he told the Australian Broadcasting Corporation. "We are very hopeful with the restoration of those services any missing persons will be able to be identified very quickly." John Wilson, a photographer for News Unlimited, spent the night in Tully while the storm passed through the area. "We lost power midway through the night, so we were sitting in dimly lit rooms, listening to Mother Nature unleash an incredibly amount of force here in the town," he said. "You could just hear the tops of the trees being shredded and the occasional snap when one would give way." The strong winds and rain also hammered hundreds of homes, and devastated large tracts of banana and sugar cane crops. The cyclone affected a large area of the coast, but the larger community of Townsville only experienced some flooding. 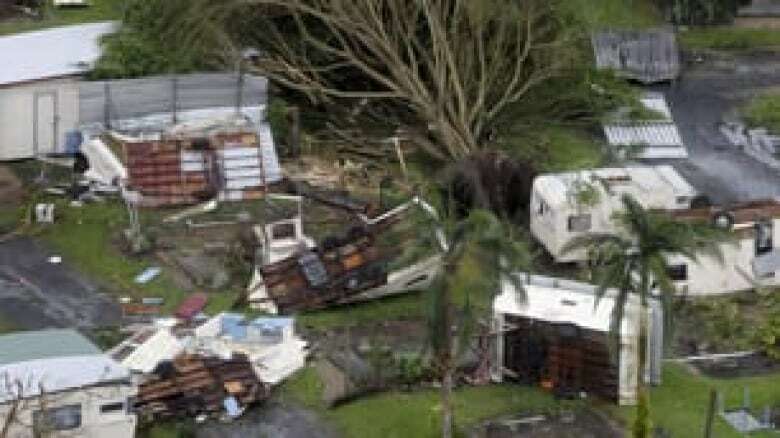 Queensland Premier Anna Bligh said several thousand people would be temporarily homeless due to the powerful storm. The Australian Red Cross and local governments were working on registering people in need and finding places to house them, she said. Bligh said emergency workers surveying the damage would need several days to do a proper assessment. The edges of the system continue to haunt north Queensland residents on the coast, with heavy rain bringing the threat of localized flash flooding. The storm damage was north of the area that recently experienced Australia's worst flooding in decades. The massive floods swamped an area in Queensland state the size of Germany and France combined, and killed 35 people during weeks of high water up until last month.